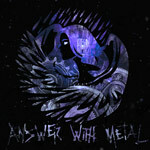 Answer With Metal are a heavy metal band from Canada formed in 2008, releasing their self titled debut album in 2012. Two further albums followed, 'Handling The Blade' in 2015 and 'Return To The Gates' in 2016. Sharing stages with the likes of Primal Fear, Hibria, Havok and Striker, have kept Answer With Metal high in the fans eye, with 2019 the year that the world will see, err, hear, the bands fourth album 'Centralia', with 'Wild Hunt' released as the first single. Blending the styles of thrash and power metal, Answer With Metal deliver heavy hitting and harsh, head bang able heavy metal. Ten years and four albums have honed the band into a ferocious unit, fierce and fiery and a full on blast of heaviness. The first single off the upcoming album is a fiery blast of full on and in your face heavy metal. 'Wild Hunt' is lightning quick, head bang able and a furious foray of ferocious riffage. Senses will take an immense pummelling as 'Wild Hunt' rockets by in a flash. The upcoming album 'Centralia', is the bands fourth offering, and on the evidence of the first single it is likely to be the bands best work to date. Due for release in early summer, 'Wild Hunt' is a mouth watering appetiser for what should be a great album. Overall, fierce and fiery, 'Wild Hunt' is fast paced heavy metal, head bang able and an exciting appetiser for the bands new album.